The Digital8 format is far superior to Hi8 or Video8. Sony was the first to introduce this format in 1999. 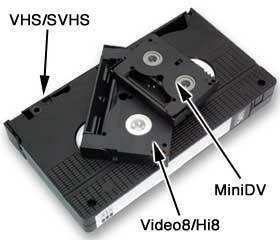 It is backwardly compatible, meaning that the new Digital8 camcorders and VCR's will also play 8MM and Hi8 tapes. A Hi8 tape will record up to 60 minutes of digital video and audio. Because of the design, using regular 8mm tapes is not a problem, but it uses twice as much tape. A 2 hour Hi8 or Video8 tape will record 60 minutes when done in the Digital mode. Digital8 tapes record their signal at 525 lines of horizontal resolution, substantially higher than 8mm or regular VHS formats, and due to their higher band width greater color fidelity and detail is possible. The video signal is recorded as DV video which is the same as MiniDV. Due to the digital nature of the recording, no signal loss will result from dubbing, so they make an excellent master copy. All Digital8 camcorders have a firewire (also known as i-link and IEEE 1394, but firewire is the name given by its creator), allowing easy downloading of the video to a modern computer with a firewire port for editing. I received the DVD's today. That was very quick. I have already looked at several films that were transferred and I'm very happy with the service. You guys are really good at what you do. Thanks a lot!